Apple today made one of its weekly updates to the App Store, adding a new featured category that highlights "Pay Once & Play" games in the App Store. As noted by MacStories, the section includes a list of popular game titles that do not include in-app purchases. The new feature has appeared in European App Stores already and should be making its way to other countries as the weekly update propagates. 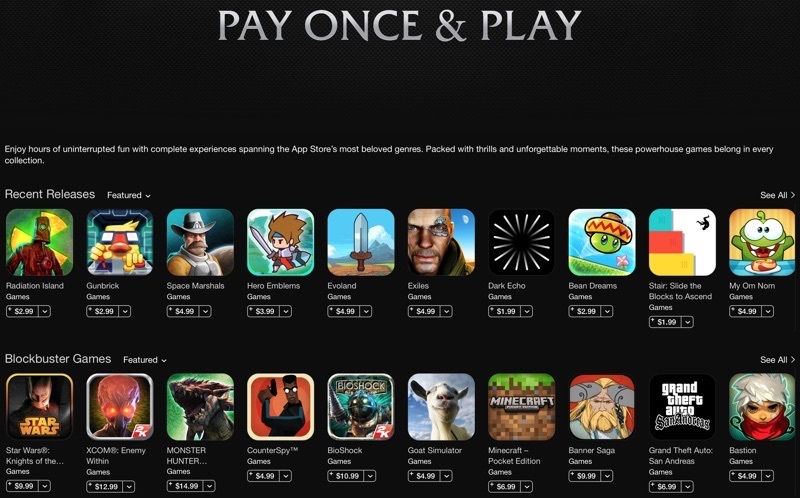 "Pay Once & Play" offers a range of titles that are organized into the following categories: Recent Releases, Blockbuster Games, and App Store Originals. Some of the featured titles include Thomas Was Alone, Minecraft - Pocket Edition, Hero Emblems, Threes, Blek, and Goblin Sword. Games and apps with in-app purchases have gotten Apple into trouble on multiple occasions over the past few years, leading to a 2011 lawsuit and a $32 million settlement with the FTC after children racked up hundreds of dollars in purchases without parental knowledge. Apple has made several changes to the App Store since the original lawsuit was filed. Apps with in-app purchases are clearly labeled, Apple obtains express permission for an in-app purchase in the form of a pop up, and it notifies users that making an in-app purchase authorizes additional in-app purchases for 15 minutes. Most recently, Apple changed the "Free" wording on purchase buttons to "Get" to make it clear that apps with in-app purchases are not truly free. Update 1:37 PM: The new feature has hit the U.S. App Store and includes a slightly different set of apps. A few titles such as Threes! and Thomas Was Alone that are featured in Europe are not on the U.S. version, while U.S. users will see other titles such as Dark Echo and Grand Theft Auto: San Andreas. I'd love to check out the link, but I have to wait another 19 minutes for my energy to refill. I would never pay $1.99 for a game. I'd rather spend $20 on gold coins. Pay me $0.99 and you can recharge right away. I love this, this is LONG overdue. Glad to see this. I personally hate in-app purchases. Understand the logic, but hate it nonetheless. Feels like a bait and switch. the problem is in-app has two flavors: one-time and 'currency'. The one time stuff allows for new levels and whatnot. Its the 'currency' model that infuriates everyone. Traditional (pay and own) in-app allows you to try for free and buy the full game, which centralizes the reviews and simplifies the review and upload process for developers. Freemium is the cancer of video games. Glad to see a stand against it, albeit a small stand. if i'm looking for free stuff, don't lump in the "Free with in App purchases", because then that game isn't really free. Similarly, I don't want to buy a game, just to find out that there's "pay to win" in it. Awesome this is great !! !